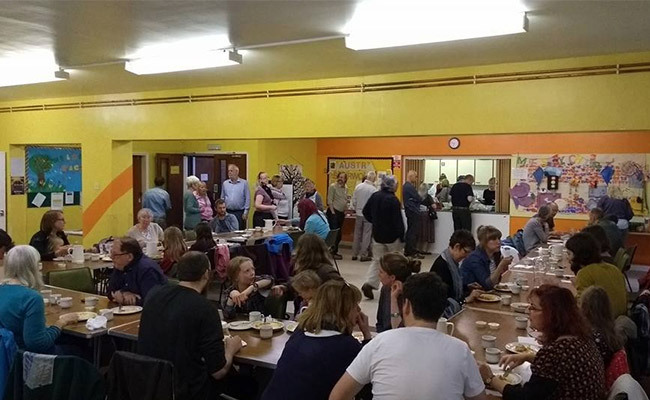 Sharing Sherwood is a monthly social eating cafe held at Sherwood Methodist Church, Sherwood Nottingham. The cafe uses surplus food from supermarkets that would have otherwise gone to waste and serves it up as a delicious 3 course vegetarian community meal. The project aims to make the link between food waste and food poverty and each month has a speaker relating to the topic of food, waste, poverty, or local entertainment. In the United Kingdom around 15 million tonnes of food is thrown away every year. 20 to 40% of crops are discarded by farmers because they “didn't meet the retailers' standards” but are otherwise perfect to be consumed. Almost 50% of the total amount of food thrown away in the United Kingdom comes from people’s homes. In total the country throws away 7 million tonnes of food and drink, 4.4 million tonnes of this could have been eaten. Some of the reasons for throwing the food away include: because it was past its date, it looks, smells or tastes bad, went mouldy or was just left over from cooking. Rotting food produces methane. The amount of methane that is produced is 23 times worse than CO2. If we all stop wasting food that could have been eaten, the benefit to the planet would be the equivalent of taking 1 in 5 cars off the road. 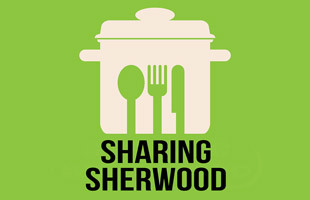 Sharing Sherwood is almost 4 years old. We're on a constant learning path and always looking for ways to improve things. The meal costs a minimum donation of £2.50 adults, £1.50 kids and all profits go to Nottingham foodbanks.